for Saturday’s clash with Rangers after the striker was taken to hospital after injurying his ankle in training yesterday. Stewart was left in pain after blocking a shot and the fears of the Stark’s Park medical staff were sufficient to seek further assessment for the 27-year-old frontman. 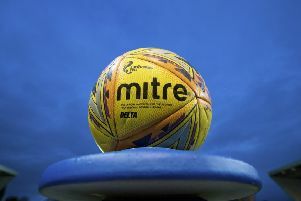 Stewart has spearheaded Raith’s play-off push in recent weeks, netting five times in the last eight games to help the Kirkcaldy club stand on the brink of a shot at promotion. The loss of the former Bradford City and Kilmarnock player would be a major blow, especially as Rangers prepare to arrive in Fife seeking the victory that could land them the Championship title. Raith will already be without Scotland under-19 striker Ryan Hardie, who is on loan from Rangers and is precluded from playing against his parent club. But on-loan Leicester City striker Harry Panayiotou is expected back from international duty with Saint Kitts and Nevis in time to face the league leaders in front of a packed Stark’s Park. Manager Ray McKinnon said: “Mark hurt himself in training and he was taken to hospital to get checked out. He blocked a shot and hurt his ankle, but we’re just waiting to hear back on how bad it is as we need to wait for the swelling to go down. “We’re not really sure of the extent of the injury, but we’ve been told there’s no break in there.